The neighborhood’s been watching this formerly tax-forfeited building. We’re thrilled to show the result of about two years’ work: Studio and showroom spaces for our handmade tile, polymer clay and glass businesses; products used in home building and decorating. In 1925, this was a gas station, with outdoor pumps now long gone, their spaces enveloped in the first addition. There were seven roof levels and four garage doors still hidden. When we discovered those, it changed completely what we would do to orient our studios, not unlike what residential remodeling can entail. 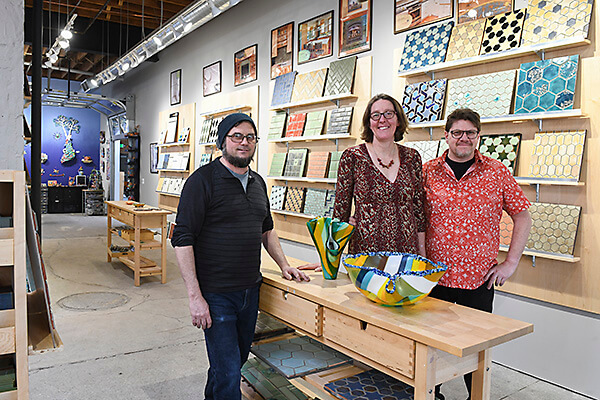 Bring the family April 27-28 to see hands-on how tile is extruded, stop in for glass tours (see page 10) and use our Experiential Art-tiled bathrooms. And come back for Art-A-Whirl® May 17-18-19.